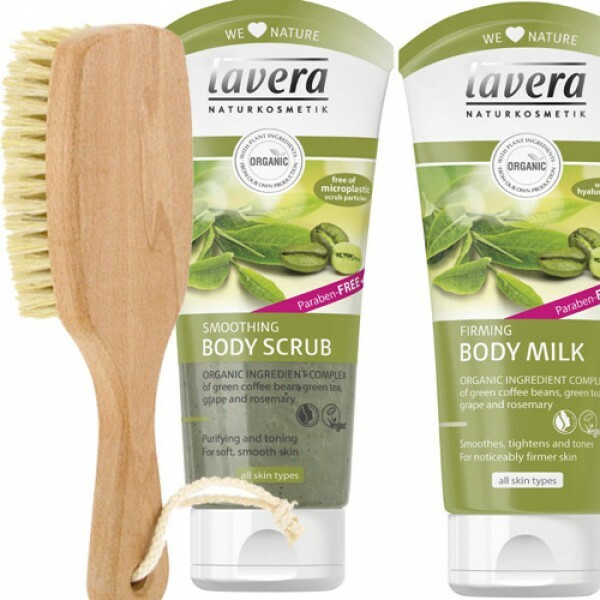 Body brush, scrub and body milk to buff your body to silky smoothness with a £4 saving off the usual price. Body Massage / Sauna Brush: For use just before your morning shower (or in the sauna) to really get the circulation going. Short handle make this brush really easy to hold firmly for a vigorous body brushing. Smoothing Body Scrub: removes dead skin cells thus reducing unwelcome even skin. 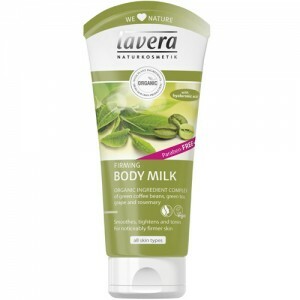 Firming Body Milk: Smoothes, tightens and tones for noticeably firmer skin within 2 weeks when used daily. Green Coffee Bean and Green Tea: have stimulating properties and reveal smooth firm skin. Rosemary & Grape: have a stimulating effect and leave skin feeling silky soft. Body brush, exfoliate and massage in body milk daily for smoother, firmer, skin. Step 1: Dry skin brush with massage brush. Step 2: Exfoliate with Lavera's Smoothing Body Scrub. Step 3: Apply body milk daily to body and massage using circular motions.